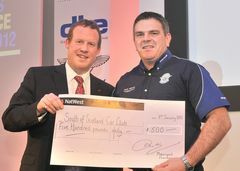 The South of Scotland Car Club was presented with the National Motorsport Week 2012 prize, of £500, on Thursday 10th January at the MIA Business Excellence Awards Dinner. Roland Proudlock, Secretary of the South of Scotland Car Club said: "The members of the South of Scotland Car Club are delighted, having attained the top award for their event run during National Motorsport Week. Working in close liaison with Tesco and Dumfries and Galloway Constabulary, this event certainly grabbed the attention of those it was intended for and forged links with younger members of the public who had never before considered motor sport as a potential hobby. We'd like to thank the judges for making us their primary choice and assure them the £500 prize money will be spent wisely, on items that will make the club more effective, long into the future". National Motorsport Week (NMW) 2012 took place from 30 June – 8 July 2012, to celebrate UK motor sport. NMW features a wide range of initiatives and activities ranging from novice taster events run by local motor clubs to factory visits and open days at many of the UK’s premier motor sport-focused organisations. South of Scotland Car Club edged into the lead, as they succeeded in getting members of the public to compete on the day in their own cars.